In hot and humid areas of the country, bathrooms are often the first room to suffer. After all, even in dryer climates, bathrooms spend a lot of time bathed in warm, humid air. In places like West Palm Beach, it can be difficult to get bathrooms to dry all the way out. Even if you clean carefully, grout and tile can stain, leaving it impossible to get your bathroom really clean and fresh again. This is where bathtub reglazing and refinishing in West Palm Beach can start to make a big difference. At Artistic Refinishing, we take every care to make sure your bathroom is up to date, healthy, and beautiful when we leave. As one of the three major cities in South Florida, West Palm Beach is a great place to be. From El Cid to the Old Northwood Historic District, the area offers a wide variety of attractions and possibilities for homeowners. The area’s climate falls into the tropical rainforest designation, with all months having average temperatures over 64 degrees Fahrenheit. With thunderstorms and wet sea breezes a big part of the climate throughout the afternoons, the humidity in this area never really falls during summer. Artistic Refinishing exceeded my every expectation. I’m speechless. While resurfacing a bathtub, or other surfaces in the bathroom, sounds like a major undertaking, it is actually much simpler than replacing an entire stall or tub. A complete redesign means that multiple contractors are involved, and structures like the subfloor and studs are often damaged and need to be replaced. When you opt to refinish your bathtub or sink instead, you get a smooth, durable, nonporous surface that generally takes less than a day to dry. Durability means that the bathroom surfaces will last longer before they need to be refinished again. 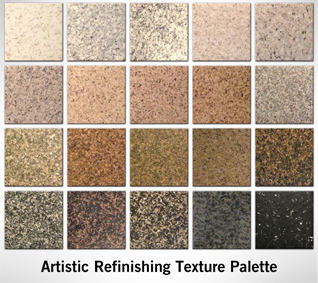 Artistic Refinishing also offers a number of high quality-finishes in different colors, which can be applied via different techniques for varying effects. When You Need Bathtub Reglazing in West Palm Beach, Call Us! Whether you’ve decided your bathroom needs to be updated, or you’ve moved into a new home and are looking for an economical way to give the bathroom a new look, contact Artistic Refinishing for your bathtub reglazing and refinishing needs. We will give you a free quote on the service you’re looking for, and you’ll receive the benefits of our many years of tub reglazing and refinishing in West Palm Beach. Visit us today to find out more about the available finishes, how they are applied, and how this technique can benefit your home.